Here are two important vital sign tests to learn! The two important tests are the skin-pinch to check for hydration and the capillary-refill test. The skin-pinch is easy to perform by taking a pinch of skin. 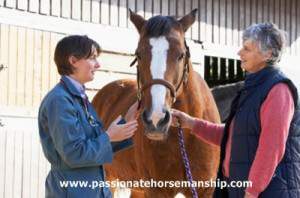 I usually do the skin-pinch at the middle of the neck, but you can also check by pinching the skin just over the point of the horse’s shoulder. After you let go of the pinched skin count how long it takes for the skin to return to a normal flattened state. If it takes two to three seconds for it to go flat, your horse is probably dehydrated. If I find that my horse is dehydrated I immediately give them Dyna Spark™ (electrolyte formula for horses). The capillary-refill test is easy to perform by pressing your thumb against the horse’s gum for a couple of seconds and then release. When you release start counting the number of seconds it takes for the whitened gum to return to the normal pink color. One or two seconds is normal. If it takes longer than one or two seconds it may indicate your horse is dehydrated or stressed. Before you do this test look at your horse’s gums and notice the color. If you horse has any of the following gum colors a chalky white, yellowish, dark red or purplish this is something to be concerned about. A horse with normal healthy gums has a good pink color. These are two things you will want to be aware of what is normal before an emergence arises. When an emergency does happen you will be able to communicate this information to your veterinarian which can be very valuable. NOTICE/DISCLAIMER: I am not a veterinarian and I do not offer medical advice to others. The following is not intended and should not be viewed as a substitute for appropriate veterinary or medical care. Any information provided herein comes from my personal experiences and from various companies, health care professionals and individuals who have researched and/or dealt with the health issues included in post. Please use what feels appropriate to you, and consult with your allopathic or holistic veterinarian for proper diagnoses of medical issues before proceeding with the suggestions contained herein.